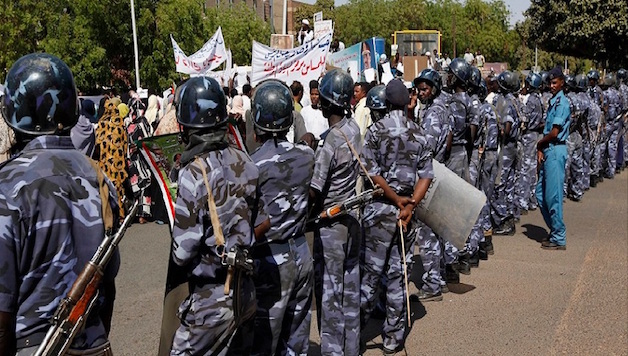 Frightened that these protests could develop into a wider movement, the dictatorial regime of Omar Al-Bashir has responded with strong repression. Scores of protesters, journalists, human rights campaigners and political activists have been ruthlessly attacked, intimidated and arrested, and the police has been deployed in silencing the voices on the street. Yesterday Wednesday 17 January in the early morning, the main leader of the Sudanese Communist Party has been arrested at his home by the police. This arrest comes a day after a CP-organized demonstration against the government’s austerity measures gathered thousands of people in central Khartoum, shouting slogans like “No to hunger! No to high prices!”. This was the largest protest thus far since the recent wave of struggles begun, and it was brutally repressed by the state forces with teargas, beatings and many arrests. On Wednesday afternoon, in another protest organised by the opposition, a new wave of arrests and arbitrary detentions took place. An eyewitness who spoke to the CWI just before that protest reported political police deployed in unusually large numbers, and explained that authorities had flooded the square where the demonstration was set to take place with water tanks, in order to prevent it becoming a focal point for people expressing their anger at the regime and at its anti-poor policies. This type of measures betrays a sense of panic from the part of the corrupt Sudanese ruling elite at the spectrum of mass revolts breaking out in the coming period. The CWI wishes to express its full solidarity with the people of Sudan, braving the ruthless repressive machinery of al-Bashir’s regime to fight for a decent future for themselves. We demand the immediate and unconditional release of all the activists, protesters, critics and political dissidents who have been arrested by the authorities over the last days.